The Liberian civil war which began in 1989 exhibited all the manifestations and consequences of post cold-war intra-state conflict, state collapse, ethnic conflicts and political fragmentations. The late response of the United Nations at intervening in the impasse adds a new dimension when studying the Liberian question. Therefore, this article critically examines the peacekeeping efforts and role played by the United Nations Observer Mission in Liberia (UNOMIL) and Economic Community of West African States Monitoring Group (ECOMOG) during the war. The author pays particular attention to the collaboration efforts of the UNOMIL and ECOMOG in restoring peace and stability in Liberia. The article provides a historical background of the Liberian civil war which led to the deployment of the UNOMIL and ECOMOG highlighting the successes and failures of the UN and ECOWAS contingents as regards the rivalry that existed between the UNOMIL and the ECOMOG peacekeeping force in Liberia in the process of restoring peace and stability in the country. In exploring the ineffective international response in the Liberian crisis and the challenges ECOMOG faced in restoring a semblance of peace in the country, the author analyzes the views of various scholars on the subject as well as those of some participants and victims of the war granted in interviews after the war. A case study and concrete historical method is used in this study as well as reliance on interviews to study the various ramifications of the UNOMIL and ECOMOG interventions and the aftermath of the conflict. The paper concludes after a thorough and tentative research on the subject matter that the UNOMIL and ECOMOG deployment and intervention in Liberia’s civil war and the human rights abuses and the humanitarian assistance were during the conflict, in which some successes were recorded in the humanitarian arena largely due to ECOMOG’s ability to restore a semblance of order and peace which allowed international humanitarian agencies to return to Liberia. The late political response of the UN to Liberia’s crisis which was not until October 1992 impeded the effectiveness of the international response in the Liberian crisis which propelled the pivotal role that regional organizations began to play in keeping peace and ensuring security and stability on the Continent. The plethora of scientific work and publications by scholars on the Liberian question, including those of Russian academicians is indicative of the relevance of the study especially as it pertains the lessons learned from the successes and failures of the various attempts at peacekeeping in Liberia. Liberia, intervention, United Nations, UNOMIL, ECOWAS, ECOMOG, civil war, peacekeeping. BACKGROUND OF LIBERIAN CIVIL WAR A large body of work has been written on the remote and immediate causes of the Liberian crisis, but one that stands out is that of either the perceived and/or real marginalization of indigenous Liberians who form a majority of the Liberian population by the minority Americo-Liberian elite. Available data preceding the war has it that the America-Liberian elite - who are Liberians of African-American, Afro-Caribbean and liberated African descent - represented only five per cent of the total population of Liberia. However, this minority group controlled both political and economic power in the country almost with the exclusion of the majority of the citizens. It is on record that of the country’s 19 presidents before the April 12, 1980 coup that brought in Samuel Doe to power, none was of indigenous Liberian extraction. In fact, 11 out of the 19 presidents prior to 1980, were born in the United States of America. This kind of arrangement led to the systematic marginalization of the indigenous Liberians. Little or no attention was paid to the needs and sensibilities of the majority, especially in areas that concern the people’s laws, customs and religious beliefs. The Americo-Liberian elite controlled effectively all the vital structures for political participation and expression of dissent in the country [Amadu 1992: 30-31]. Although the Liberia constitution makes provision for citizens numbering three hundred and above to establish a political party and compete for political power, that right was never conceded by the ruling True Whig Party (TWP) until the advent of the Progressive Alliance of Liberia (PAL), led by Baccus Mathews in 1975. The TWP remained in power for over a century, from 1878 to 1980. Yet this party was unable to respond fully to the political yearnings of the educated indigenous Liberians who advocated for political inclusion in the dealings of national affairs and resisted in no small measure the continued dominance of the Americo-Liberia political oligarchy. This reluctance on the part of the TWP to reform and accommodate the so-called “non-conformist” into its fold contributed significantly to the collapse of the first Republic in April 1980. On April 12, 1980, a group of non-commissioned officers of Liberia Armed Forces, led by Master Sergeant Samuel Doe, staged a military coup that overthrew the Liberian government and assassinated President William Tolbert. The coup at the time was imminent and appeared reactionary to the persistent political dominance and economic marginalization of the indigenous Liberians by the Americo-Liberian elite. The general rising social discontent, and political repression both in military and in the broader Liberian society was palpable. The coup could be adjudged to have only temporarily led to an end of the political dominance by the Americo-Liberians, since the founding of the country by former/freed slaves from America in 1847. It is important to note that Mr. Doe who became President following the coup, soon imposed a reign of terror on Liberians, especially those in the opposition. He alienated the political elite and drove many of them into exile. In an attempt to perpetuate himself in power, President Samuel Doe polarized his power base, the Armed Forces of Liberia (AFL), by recruiting and surrounding himself exclusively with his Khran tribesmen. This resulted in an insurgency by the National Patriotic Front of Liberia (NPFL) led by Charles Taylor, who could no longer bear the hardship the Doe regime brought on the people. Charles Taylor’s NPFL was said to be supported by Libya, using Ivory Coast as the launching pad for the rebel forces while training took place in Burkina Faso. The activities of the rebel forces under Charles Taylor in the late 1980s against the Doe regime precipitated the early days of the Liberian civil war. Using guerrilla war tactics with a few hundred insurgents loosely launching an offensive from Cote d‘Ivoire, the NPFL although lacking organization, recruited more soldiers and formed a formidable force that was sufficient enough to cause an upset to the government of President Samuel Doe [Maresko 2004]. Brutal fighting became inevitable from the beginning, both by the NPFL rebels and the Armed Forces of Liberia (AFL), President Doe’s fighters. The war continued for seven years, from 1990 till 1997, and is divided into three phases. The first phase was the year-long revolutionary campaign that took place in 1990, resulting in a bloody sweep across the nation lead by Charles Taylor’s NPFL. The second phase of the war was between 1990 to 1992 and saw the world’s first regional military intervention sponsored by the Economic Community of West African States (ECOWAS) [Alao 2000: 23-25; Abiodun 1998: 23-25]. This peacekeeping force was called the ECOWAS Ceasefire Monitoring Group, referred to as ECOMOG. Phase three of the war began with the breaking of this ceasefire with what is known as “Operation Octopus”. This operation began in October 1992 and was one of the most destructive periods of the war. It is pertinent to state that the second phase of the war which saw the emergence of ECOMOG which was led by the armed forces of Nigeria. The Nigerian government then openly supported Doe’s presidency and was preferential to the AFL’s cause. Some scholars have posited that ECOMOG’s political ties eventually lead it to enter the war almost as another military faction/wing against Taylor’s NPFL. ECOMOG did, however, attain a ceasefire at the end of 1992 with all of Liberia controlled by Taylor’s NPFL except the capital city of Monrovia. However, the Operation Octopus - which was a systematic break of the initial ceasefire by Taylor’s forces - a surprise attack, meant to be Charles Taylor’s final attempt to solidify control over Monrovia from ECOMOG led to a brutal confrontation by the two forces. ECOMOG did ultimately hold its ground in Monrovia and this move became an indication of great failure for the NPFL as the action led to a fostered unity among opposition groups and earned Taylor a poor international reputation as a result of the record of excessive human casualties. ECOMOG then launched an attack on the NPFL while re-supplying the AFL, embarking on a period of sporadic fighting amongst all factions with interludes of ceasefires until 1996. The end of the war was embodied by a controversial national election held in the 19th of July, 1997, in which Charles Taylor emerged as a new president of a frail and battered Liberia. Suffice it to say that by May, 1990 the Liberian conflict had degenerated into an unspeakable tragedy. Thousands of people had died in conflict related situations, most of whom were civilians, and hundreds of thousands of others had been turned into refugees as a result of the war. Thousands of civilians, Liberian nationals, citizens of other ECOWAS nations, diplomats and foreign citizens were exposed to the hazards of war as well as the consequence of starvation and disease. As a result of continuing intransigence on the part of the factions and the worsening plight of Liberians, the Thirteenth Session of the Authority of Heads of State and Government of ECOWAS convened in Banjul, Gambia, in 28-30 May, 1990, under the chairmanship of Blaise Compaore of Burkina Faso to formally address the Liberian question and take an official position. It was at this meeting that President Ibrahim Babangida of Nigeria proposed the setting up of a Mediation Committee. The Standing Committee was charged with a purely mediatory role between all factions. It was neither mandated for, nor permitted to intervene militarily in the conflict. After the Banjul summit, ECOWAS Heads of State and Government and their respective Foreign Ministers embarked on a busy marathon of meetings and consultations. Discussions were held extensively with the warring parties and with other interested Liberian groups. As a result of these rounds of consultations, a ministerial level meeting of the Standing Mediation Committee was held in Freetown, Sierra Leone, in 5-20 July, 1990. Despite these attempts, very little was achieved at this meeting, in terms of finding a solution, because the warring factions refused to put an end to hostilities. This led the West African Heads of States under the umbrella of ECOWAS Security Standing Committee to hold a meeting in July, 1990, and took a decision to establish a peacekeeping force in Liberia [Bokeriya, Tijjani 2018: 48-49]. The ECOWAS Ceasefire Monitoring Group (ECOMOG) was subsequently established with a view to bringing to an end the unwarranted killings and destruction of properties in Liberia. ECOMOG AND UNOMIL DEPLOYMENT IN LIBERIA The ECOMOG operation started on August 24, 1990, with deployment of 3,000 West African troops into the Liberian capital Monrovia. It was tasked with assisting the ECOWAS Standing Mediation Committee in supervising the implementation and in ensuring the strict compliance by the parties with the provisions of the cease-fire throughout the territory of Liberia [Weller 1994: 4-7]. Whilst the commander initially envisaged a six month operation, the force continued to be deployed until late 1999, and, indeed, expanded its operations into neighbouring Sierra Leone. The contributing nations and troop strengths varied, but included at one time or another Nigeria, which provided the bulk of the forces, Ghana, Guinea, Senegal, Gambia, Mali, Benin, Cote d‘Ivoire, Uganda, Tanzania, Niger, Burkina Faso and Sierra Leone. In February 1995, the force consisted of 8,430 troops organised into ten battalions; of these troops 4,908 were Nigerian, 1,028 were from Ghana, 609 from Guinea, 747 from Tanzania, 760 from Uganda, 359 from Sierra Leone, and ten each were provided by Gambia and Mali1. The force peaked at strength of around 16,000 in 1993 and by early 1997 consisted of around 11,000 troops. During the period of its deployment, ECOMOG engaged in a variety of missions including protection of humanitarian aid, disarming of factions, cantonment, mediation, and peace enforcement. ECOMOG’s formal peacekeeping role ended in February, 1998, but a contingent of 5,000 remained deployed after this in a capacity-building role, helping to train the new Liberian security forces and to maintain order. Further withdrawals commenced in January, 1999 after disputes between ECOMOG and President Taylor over the treatment of ECOMOG soldiers by Liberian forces2. that certain factors such as the increasing violence in Liberia led to the intervention by ECOMOG and UNOMIL. A case in point is the insurgency movement of the NPFL in December, 1989 led by Charles Taylor, who began an onslaught against the government of President Samuel Doe. In Just a few months of the war which took place in gross violation of international humanitarian law, there was destruction of government institutions, loss of lives and property [Alao 2000]. During this period, many opposing groups struggled for power and territory. This conflict led to the death of almost two hundred thousand people, with almost half of the population internally displaced thereby becoming refugees [Ero 1999: 176]. By May 30, 1990, the war in Liberia became a subject of serious international concern and interest at the 13th Summit of the Heads of Government of the ECOWAS member states. Nigeria from the onset advocated for military intervention as a result of the fragile security situation in the country and the deteriorating humanitarian situation therein. The decision by ECOWAS to establish ECOMOG became imminent, which was mandated to initiate the intervention in the conflict for the sole aim of putting an end to the bloodshed [Ero 2000: 46]. Besides the initial political divisions between Anglophone and Francophone memberstates of ECOWAS on the question of using military force in the intervention, some states expressed serious doubt regarding the legitimacy of the mission and its mandate. In view of this, another argument was to the effect that the ECOMOG mission was conceived to be for peacekeeping and observation and hence there was no peaceful agreement on the action of the observer group in Liberia during the introduction of the peacekeeping forces. That notwithstanding, Charles Taylor’s rebels attacked the ECOMOG forces even before they were settled in Liberia; this unfortunately led to the application of force to repel the attacks. So an observer group was compelled to respond with force. The UN Security Council made known its official position on the conflict in November, 1992, that was before the adoption of the resolution 788, in response to ECOWAS request to impose an economic embargo against the warring parties in Liberia [Kufour 1993]. This resolution became the first step, made by the UN in support of the ECOMOG intervention in the Liberian civil war. In the document, the Security Council approved the actions of the regional peacekeeping forces, recognized the military attacks against it and supported that peaceful settlement to be reached with the mediation of ECOWAS. Finally it imposed sanctions on all rebels. Ammunition and military hardware were banned from entering Liberia except those meant for ECOMOG [Sesay 1995]. The adoption of this resolution is considered by many scholars as the breaking point in the politics of the UN in relation to Liberia. The appointment of a special envoy by the General Secretary of the assembly, made the UN to become an integral part of the multidimensional diplomatic efforts on the regulation of the conflict which could directly influence the peacekeeping process in Liberia. The collaboration efforts of the UN and the then Organization of African Unity (OAU) led to a situation whereby in the course of the Geneva talks, the special envoy became a catalyst in facilitating the signing of the Cotonou peace agreement in the republic of Benin in July, 1993 [Bell 2003]. Several reasons speak to the importance of the peace agreement; it took into consideration the interests of rebel groups who had been absent in previous agreements; it considered demobilization as a first step preceding the conduct of national elections; it also compelled all warring parties to comply with the ceasefire agreement. This peace agreement was written by the Liberian national transition government in which representatives of all factions were carried along. Furthermore, in recognizing the legitimacy and authority of ECOMOG, the agreement sought to separate the responsibility for maintaining peace between the regional organization’s mission - ECOMOG and the UN observer mission which was called to control the implementation of the agreement. The Cotonou agreement took cognizance of the structure of the UN mission, in order to achieve the approval of the global organization in the intervention of West African countries in Liberia. In practice, the participation of the UN in actualizing a peace process could have become the minimum price that Charles Taylor could have accepted considering his suspicion of the ECOMOG forces, dominated by Nigerian forces. The UN Security Council finally approved the establishment of the UN Observer Mission in Liberia (UNOMIL), which took place in September, 1993, two months after the signing of the Cotonou agreement and over three years after the military expedition of ECOMOG in Liberia. Suffice it to say that UNOMIL wasn’t just a peacekeeping force, but an observer mission with a peculiar task of monitoring and controlling the regional peacekeeping forces. It was a mission established based on a peaceful agreement with a task to increase the authority of the Peacekeeping activities in Liberia. In other words its factual role was to show the involvement of the UN in resolving the Liberian conflict and put an end to the situation where the international community ignored the crisis and also further reduce the suspicion of the rebel factions towards the ECOMOG forces. It is pertinent to note that UNOMIL was able to successfully execute some of the tasks placed in its mandate; the presence of the force attracted the attention of the international community in the Liberian armed conflict, a result of which significantly increased the support of regional forces and expanded the international legitimacy that the force came to enjoy which it didn’t have at the onset. The Cotonou agreement regulated the functions of the two organizations. ECOMOG was responsible for the realization of a ceasefire agreement and disarmament, whereas UNOMIL conducted monitoring activities of the regional organization. On the basis of the agreement, UNOMIL and ECOMOG functioned as two separate peacekeeping operations under the leadership of two independent organizations. Each mission needed to establish its path of joint collective consultation and personal method of conducting its operation. ECOMOG was responsible for ensuring the safety of observers and civilian personnel of UNOMIL. During military operations in a certain region for instance, UNOMIL personnel had to be temporarily evacuated from such a region. ECOMOG had to at all times guarantee the safety of the UNOMIL observers and other UN personnel in the war zone of Liberia. Such an arrangement of structural operation came for hope and confidence. Performing the task of controlling the UN mission was relatively small and as such exempted it from the financial and personnel responsibilities. Nevertheless, considering the few number of unarmed UN observers, many doubted the prospects of the mission. OPINIONS OF SOME PARTICIPANTS AND SCHOLARS ON THE LIBERIAN CIVIL WAR Having discussed the various ramifications and role played by the two major peacekeeping forces in the Liberian civil war, it is imperative to provide a detailed account of the views of some participants of the crisis, which is aimed at critically analyzing the facts and figure as well as the real and remote consequences of the war. Opinions of real actors of any dispute, in my view is paramount in understanding the remote and immediate causes of the dispute, role played by warring factions as well as drawing significant lessons there from. Samuel Kofi Woods, a leading Liberian human rights activist, academic and politician who documented the atrocities and human rights abuses recorded during the Liberian civil war in his various interviews had very important opinions about what really transpired in the Liberian crisis. In one of his interviews [Seroo 2000], Mr. Woods narrated the wanton killings and human rights abuses that characterized the war period by both government and rebel forces concluded that he “saw a society yearning to be convinced about the essence of conviction... A society where there was a vacuum... A society that required more sacrifice...”. Because he believed that life means nothing if the pursuit of the truth cannot be achieved”3. He was convinced that without reconciliation and truth no meaningful peace can be achieved in a sustainable way [Petrasek 2000]. It was upon this conviction that Kofi founded the Catholic Justice and Peace Commissions in Africa, through which he was able together with his contemporaries to provide free legal service to people who cannot afford legal fees for their defence as well as represent journalists and political prisoners. Factional leaders of the crisis who suffered illegal detention also benefited from this Commission just like people who were killed or reported missing [Dennis 2005]. The relative peace and the transition to a true democratic dispensation today in Liberia could be attributed to the radio programs on human rights and reconciliation and peace building advocacy of Kofi and his group. In a similar light, renowned academician W.C. Waugh provides a detailed account of the Liberian crisis, including the move from the dictatorship to anarchy in the Liberian society. He just like Kofi Woods, held the view that the dictatorial methods of administration of both President Doe and President Taylor, led to the implosion in the Liberian society. He also strongly believed that ethnicity played a critical role in sustaining the morale of the warring factions as hate and division was used to sustain the insurgents [Waugh 2011]. He concludes in his work that the legacy of the Liberian revolution provides a hard lesson to African states that dictatorship leads to anarchy eventually and ethnic bigotry always almost escalates disputes or disagreements and must be avoided at all times as far as governance and inclusiveness in governmental affairs is concerned [Adebajo 2003]. D. Harris [Harris 2011] examines the post-conflict era of Liberia and the transition to democracy and concludes that political solutions rather than legal solutions were more important in helping Liberia and Sierra Leone curb deal with post-conflict realities. It was as if D. Harris was speaking against the sustained tribunals and legal proceedings that sought justice for the victims of the war through prosecuting the major actors of the conflict. It will be fair to conclude that Harris as much as he believed in the importance of justice, truth and reconciliation as postulated by Kofi Woods, he had a strong believe that political solutions, through inclusive policies and inclusive political participation in the affairs of the state will guarantee sustained peace [May, Furley 2016: 11-22]. Russian scholar T. Deich of the Russian Academy of Sciences alludes to the failure of the UNOMIL due to the reluctance and delay in the intervention to the conflict. She suggests in her work that a better cooperation mechanism between the UN and ECOWAS forces would have help to avoid the blood that characterized the Liberian civil war [Deich 2007]. She shares the sentiment that a regional approach is more effective in tackling regional security issues. Similarly, S. Bokeriya [Bokeriya 2013] opines that intergovernmental cooperation for security and human rights protection are getting more important, especially in the peace process. Renowned Russian expert on African Studies, A.L. Emelyanov, states in his expose on conflicts in Africa, that the perennial conflicts on the continent including those in Liberia and Somalia are not unrelated to the complex nature of the ethnic and religious compositions of African populations as well as the legacy of the artificial borders and demarcations since the Berlin conference of 1885. He however suggests that the inevitability of conflict in Africa can be mitigated through sustained efforts at peacebuilding and inclusiveness in running the affairs of African societies [Emelyanov 2011]. This sentiment is shared by other Russian academicians [Sidorova 2011; Kostelyanec 2010; Denisova 2015], who have dedicated their works to African studies especially in the Institute of African studies of the Russian Academy of Sciences. 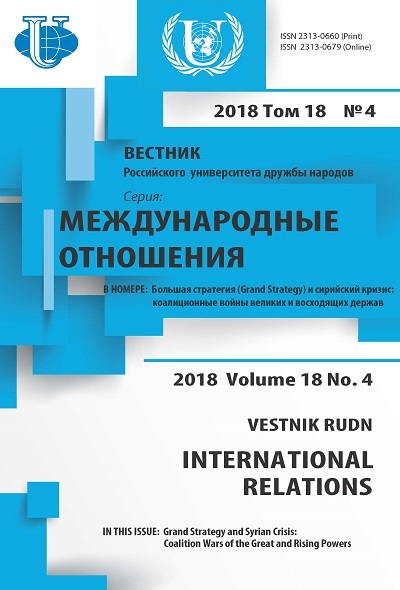 As stated in the introduction of this paper, the volume of work from Russian scientists and interest in the affairs of African societies especially as it concerns peacebuilding makes the question under study critical and topical. The views and perspectives of these authors helps us to understand the problems and real issues in the conflict which will serve as a compass for academicians and policymakers in drawing up frameworks for sustainable peace and development. THE RIVALRY BETWEEN UNOMIL AND ECOMOG IN RESTORING PEACE IN LIBERIA It is important to note that the rivalry that charaterized the Liberian peace process provided the world with great lessons to learn interms of the importance of partnership and collaboration when dealing with security issues. This is because the absence of cooperation impeded greatly the Liberian peace process. The working relation between the two peacekeeping forces suddenly deteriorated. The bigger and more robust ECOMOG group by virtue of its number and ammunition, dictated to the UN observers routes for movement, leaving them at safe posts and demanding them to respect the curfew imposed at night time, regardless of the preliminary talks regarding the freedom of movement for observers around the entire Liberian territory. Actually these forces didn’t always work in unison. The UN missions were always moved without the adequate preliminary safety provisions by the ECOMOG forces, as a result the UN observers sometimes risked being kidnapped or attacked. This arrangement had a negative impact on the perception of the local population about the peacekeeping capabilities of the organization. Many problems with which UNOMIL was confronted with had more to do with the weak conceptual basis and the technical ineptitude of the mission [Mackinlay, Alao 1995: 16]. The relationship between UNOMIL and ECOMOG was often less than harmonious. The difficulties were partly practical, such as who should be in control of joint operations, and partly psychological, not least a certain degree of resentment of the UN on the part of ECOMOG and thus an unwillingness to relinquish control. There were tensions at the higher level, between the respective force commanders, the central issue being which should be the lead force ECOMOG was already deployed and was the larger formation; UNOMIL, on the other hand, was entrusted under Cotonou with supervising implementation, which implied some kind of directing role [Truck 2000]. Additional friction was caused by the perceived UN high-handedness and an alleged lack of appreciation of the realities on the ground - including a failure to keep ECOMOG properly briefed and naiveté in their dealings with the NPFL. In part, these problems could be attributed to the late involvement of the UN; the lack of effective political direction exercised by ECOWAS in the period before UNOMIL involvement led ECOMOG to become in some senses self tasking, taking control of both the political and military aspects of operation. This naturally made it more difficult to accept co-operation with a UN agency4. Some ECOMOG soldiers also viewed the whole idea of being monitored by the UN as being at best irrelevant and at worst an act which undermined them; according to the Gambian contingent commander in July 1994, “it is like an inconvenience monitoring ECOMOG symbolises distrust”. These problems were worsened by the UN’s own attempts to improve its local profile; the “trust the UN” public information campaign in Liberia was seen by some ECOMOG members as an implied criticism of the West African force’s credibility with the population. It is, therefore, not surprise to find a certain tension in the UNOMIL/ECOMOG relationship at the lower level as well [Olonisakin 1996]. The difficulties outlined above stemmed directly from the very vague nature of Chapter VIII of the UN Charter, which does not lay down any detailed guidelines on the relationship between the UN and regional organizations5. Chapter VIII of the UN Charter permits a degree of “farming out” of responsibility; allowing regional organizations to deal with matters concerning threats to international peace and security, as long as “such arrangements or agencies and their activities are consistent with the Purposes and Principles of the United Nations”6. There is no detail elaborating the exact relationship between the regional organization and the UN, beyond the restriction that “no enforcement action shall be taken under regional arrangements or by regional agencies”. This causes particular problems in respect of multi-organization operations; which organization, for example, should lead? Who should have overall political authority? How does one avoid dual chains of operational and political control? In Liberia, the late involvement of the UN left it “imprisoned” within the framework of strategies determined by ECOWAS. This problem also extended to command and control structures, with UNOMIL having to compete with arrangements that in many cases had been established for years. This problem was compounded by the Cotonou peace accord which also failed to address such issues. The executive powers given to Special Representative of the Secretary-General (SRSG) were widely regarded as too weak and the degree of authority over ECOMOG was considered to be inadequate, as a result of this; the SRSG was cast in the role of “co-ordinator” with UNOMIL and ECOMOG having separate and autonomous chains of command. There was no one to decide categorically when, where, or how ECOMOG was to support the UNOMIL teams. These problems caused enormous practical difficulties. The coordination between the deployment of the UNOMIL and ECOMOG forces was often very poor. UNOMIL observers were sometimes deployed into areas without ECOMOG backup, leaving them in an exposed position. Thus UNOMIL personnel deployed into Lofa County and Northern Nimba were without ECOMOG protection and in summer 1994 observers were subsequently held hostage following a dispute over alleged arms deals with a warring faction. Even where UNOMIL and ECOMOG were deployed together, UNOMIL was sometimes subject to so many ECOMOG restrictions that the credibility of the UNOMIL operation was undermined. Against the backdrop of the enthusiasm that greeted the involvement of the UN in Liberia, little effort was invested in the practical realization of the mission in improving its relationship with ECOMOG. Neither the Cotonou agreement nor the agreement between the UN and ECOWAS determined how UNOMIL was to undertake its control over the armed forces which were under an independent command and owing to the size of the personal operations, with enormous power. The capabilities of the UNOMIL and the special representative of the UN Secretary General for executing its mandate was heavily dependent on the military support of ECOMOG. In the absence of mechanisms for coordination and control over the efforts of different command structures, capabilities of the UN mission, there were serious limitations. The relationship further worsened, the regional group almost didn’t receive any political instruction from ECOWAS, there wasn’t a functional mechanism which could help the group subordinated ECOWAS because the command forces controlled not only the military but also the political aspects of the operation. Therefore, the political partnership between the UN and ECOWAS did not reflect cooperation on other different levels. ECOWAS was also faced with serious material and technical setbacks in connection with insufficient funding and inadequate equipment. Because of this series of problems arose with disarmament and demobilization of the warring parties under the auspices of the UNOMIL. UN observers became totally dependent on the West African forces that provided them with security. To complicate matters further, most ECOWAS memberstates were not paying their financial obligations thereby placing ECOMOG in a very unstable financial position. Furthermore, as a result of the irregular rotation and the inconsistent remuneration, the morale and discipline of the ECOMOG forces was hampered. The constant flagrant disorder of the ceasefire agreement, resumption of military action and inability of ECOMOG to provide sufficient security for UNOMIL, the UNOMIL could not execute much of the responsibility in its mandate and from time to time had to evacuate its observers from Liberia. In November, 1995, the UN Security Council reduced the UNOMIL presence to 160 observers and also made changes in the mandate of the mission, thereby reducing its role in supporting the ECOMOG operations and the activities of the transition government. HUMAN RIGHTS ABUSES AND HUMANITARIAN ASSISTANCE IN LIBERIAN CIVIL WAR The civil conflict in Liberia has been characterised by major abuses of human rights. All factions share the blame. The use of 6,000 children in combat is a flagrant example of disregard for the rights of the child. The Lutheran Church massacre in 1990, which claimed the life of 600 civilians, and the Harbel massacre of June 1992, where another 600 non-combatants were murdered in a five-hour period, are but extreme examples of atrocities which have been committed throughout the country [Whitman, Fleischman 1994: 65]. One of the most disturbing features of the Liberian civil war has been the use of child soldiers. Thousands of children under the age of 15 are said to have fought with the warring factions, and are also among the conflict’s victims. International law - Protocol II to the Geneva Conventions of 1949 and the United Nations Convention on the Rights of the Child - forbids the use of children under the age of 15 as soldiers in armed conflict. Protocol II is binding on armed opposition groups as well as governments. The African Charter on the Rights of the Child, which was ratified by Liberia, but is not yet in effect, sets a higher threshold for the minimum recruitment age, stating that no one under the age of 18 can serve in armed hostilities. The absence of credible security guarantees from the warring factions has prevented effective humanitarian assistance in Liberia. Since the beginning of the conflict, the relief community has been frustrated by the warring factions’ disregard for humanitarian mandates. While sustained relief activities have been limited to greater Liberia, as in February, 1995, the number of non-combatants within Liberia who have been affected by the conflict has reached 1.8 million7. Of this number, 1.5 million persons have been provided with life-saving assistance in areas where the United Nations agencies and their relief partners are able to operate. In addition to Liberian civilians affected by the conflict, the most recent available information shows that there are 870,000 Liberians refugees in Cote d‘Ivoire, Guinea, Sierra Leone, Ghana and Nigeria. The humanitarian crisis in Monrovia is of particular concern as it was aggravated by a steady flow of internally displaced persons. Built to support a population of 300,000, Monrovia is now a sanctuary to over 1.3 million people. Although the UN agencies, nongovernmental organizations and national organizations (including the Liberian Refugee, Repatriation and Resettlement Commission) have been able to respond to the city’s steadily rising needs, they are approaching the limits of their capacity to do so. On February 3, 1995, the Secretary-General launched an inter-agency consolidated appeal for Liberia, for the six month period from January to June 1995, seeking the 65 million USD in extra-budgetary resources required by the UN agencies to continue their work8. There have been some successes in the humanitarian arena largely due to ECOMOG’s ability to restore a semblance of order and peace which allowed international humanitarian agencies to return to Liberia. At the same time, a joint operational coordination among relief workers and ECOMOG throughout ECOMOG-controlled areas has led to the restoration of water supplies within most regions. Alongside this, the coordination has led to the institution of programmes aimed at sanitation and shelter in the camps for internally displaced persons in Buchanan, Grand Bassa and Margibi, where the United Nations agencies, NGOs and national organizations are assisting a growing number of displaced Liberians. CONCLUSION The ECOWAS intervention in the Liberian conflict became an unprecedented example of partnership between the UN observer mission and regional forces which gave impetus to the first peacekeeping operation undertaken by the UN in close collaboration with other peacekeeping missions established by other organizations. Owing to the unique status of ECOWAS, the intervention in the conflict gave a practical opportunity of drawing useful lessons for future African regional peacekeeping initiatives. The intensity in the area of cooperative peacekeeping led to the formation of two important elements of peacekeeping in Africa which became active participation of regional organizations and support from the part of the UN. In the circumstances of increasing conflicts in Africa and limited resources of the UN in resolving the conflicts, the mechanisms of interactions with the regional organizations offered significant help in surmounting the political and financial difficulties in modern peacekeeping. The problems with which both UNOMIL and ECOMOG were confronted with touched a very crucial question relating to joint missions of the UN and other regional organizations as a potential method of conflict resolution in Africa and other regions of the world. The relatively small size and structural inefficiencies of the UN observer mission for instance gave a reason to suggest that the creation of the mission was indicative of the reluctance of the UN Security Council in a difficult and protracted conflict such as the one in Liberia. The failures of UNOMIL in Liberia underline the importance of establishing clear boundaries in terms of separation of powers in joint initiatives of the UN and other regional organizations. The absence of such a mechanism in Liberia led to a situation whereby the regional body (ECOWAS) conferred on itself all the powers, thereby not giving the UNOMIL the possibility to carry out its mandate and consequently impacting on the UN’s authority in the eyes of those involved in the conflict and the local population. The African mantra of African solutions for African problems needs to be adopted with caution in order to avoid the marginalization of Africa in its strategic relations with the international community. Since regional peacekeeping continues to maintain an important place, it is very important for the international community to find a better and robust means of supporting regional peacekeeping initiatives. Good Leadership and adequate funding also needs to complement such political will alongside professionalism and legitimacy which will complement the efforts of regional organizations in maintaining peace and security in the region. Abiodun, A. (1998). The Burden of Collective Goodwill: The International Involvement in the Liberian Civil War. Brookfeld: Ashgate Publishing. Adebajo, A. (2003). In Search of Warlords: Hegemonic Peacekeeping in Liberia and Somalia. International Peacekeeping, 10(4), 62-81. Alao, A. (2000). The Role of African Regional and Sub-regional Organizations in Conflict Prevention and Resolution. United Nations High Commissioner for Refugees. URL: https://www.refworld.org/ docid/4ff584a82.html (accessed: 9.12.2018). Amadu, S. (1992). Historical Background to the Liberian Crisis. In: The Liberian Crisis and ECOMOG: a Bold Step at Regional Peace Keeping. Ed. by M.A. Vogt. Lagos: Gabumo Publishing Co. Ltd., p. 15-41. Bell, C. (2003). Peace Agreements and Human Rights. Oxford: Oxford University Press. Bokeriya, S.A. (2013). The UN and Peacebuilding Process: Prospects for Development. European Scientific Journal, 2, 90-94. Bokeriya, S.A. & Tijjani, M. (2018). Mandates in the Success of a Peacekeeping Missions: A Case Study of Liberia. Asia and Africa Today, 7, 48-49. Deich, Т.L. (2007). Peacekeeping on the African Continent. Asia and Africa Today, 1, 18-23. (in Russian). Denisova, Т.S. (2015). ECOWAS and Problems (To the 40th anniversary of ECOWAS). Asia and Africa Today, 9, 37-43. (in Russian). Dennis, P. (2005). A Brief History of Liberia. The Center for Applied Linguistics. Emelyanov, А. (2011). Modern Conflict in Africa. 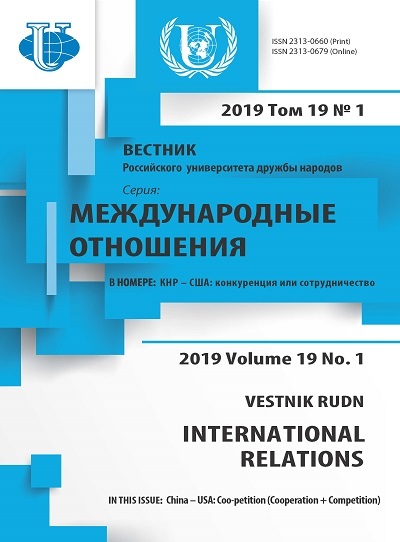 Journal of the Theory of International Relations and Political Processes, 12, 23-27. (in Russian). Ero, C. (1999). The Future of ECOMOG in West Africa. In: From Peacekeeping to Complex Emergencies: Peace Support Mission in Africa. Ed. by J. Cilliers, G. Mills. Johannesburg: South African Institute of International Affairs and the Institute of Security Studies, p. 55-61. Ero, C. (2000). ECOMOG: A Model for Africa. In: Building Stability in Africa: Challenges for the New Millennium. Ed. by J. Cilliers, A. Hilding-Norberg. South Africa: Institute for Security Studies Monograph Series, monograph 46. Harris, D. (2011). Civil War and Democracy in West Africa: Conflict Resolution, Elections and Justice in Sierra Leone and Liberia. London, NY: I.B. Tauris. Kostelyanec, S.V. (2010). African Conflicts: Dynamics and Ways of Settlement. Asia and Africa Today, 1, 40-43. (in Russian). Kufour, K.O. (1993). The Legality of the Intervention in the Liberian Civil War by the Economic Community of West African States. African Journal of International and Comparative Law, 5(3), 525-537. Mackinlay, J. & Alao, A. (1995). Liberia 1994: ECOMOG and UNOMIL Response to a Complex Emergency. New York: United Nations University. Occasional Paper, 2. Olonisakin, F. (1996). United Nations Cooperation with Regional Peacekeeping: The Experience of ECOMOG and UNOMIL in Liberia. International Peacekeeping, 3(3), 33-51. doi: 10.1080/13533319608413622. Seroo, D. (2000). Interview with Samuel Kofi Woods of Liberia. African Affairs, 99(394), 97-111. doi: 10.1093/afraf/99.394.97. Sesay, M.A. (1995). Collective Security or Collective Disaster? Regional Peace-keeping in West Africa. Security Dialogue, 26(2), 205-222. doi: 10.1177/0967010695026002009. Copyright (c) 2018 Tijjani M.A.